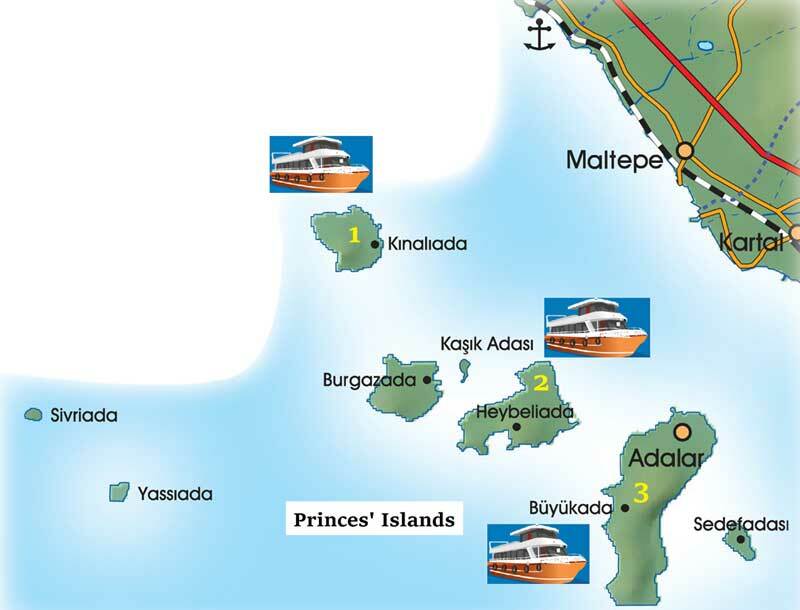 Istanbul Princes' Islands Tour offers you a chance to explore tree of the islands; Kinaliada, Heybeliada and Buyukada. Learn about the princes of the Byzantine Empire who once relaxed on these islands as you take a horse-drawn carriage tour in Heybeliada. Departure from Golden Horn with a Private Boat to the first island called Kinall. After Kinall, a visit to Heybeliada and finally Büyükada. The lunch will be served on the boat and it includes Chicken Shish Kebap with cold appetizers, rice and salad. (Drinks are excluded) Your visit to each island will be accompanied by our professional guide and you will have enough time to discover picturesque scene of the best parts of the islands and their history. Our tour is the only one which gives you the opportunity of seeing more than one island and this could be only possible by our private cruise. I was in Turkey last week with family and we really enjoyed every single bit of it :) The tour to "Princess Islands" was one among the best journeys..
1) The islands were beautiful and are places to be if you are a peace lover..
3) It was good value for money experience since the food was also nice.. The Prince's Islands are an amazing escape away from the city; a place where "time stood still" in the best possible way. Almost all of the beautiful 20th and 19th century Victorian and Art Deco houses have been preserved, and all forms of automobiles are banned on the island, creating an amazingly ranquil and serene atmosphere. Great for biking (renting one for the whole day costs just 10 TL), walking, and discovering Istanbul's historical diversity as many of Istanbul's historical Greek, Armenian, and Jewish minorities once lived here (and still continue to do so). On a one hour ferry ride from Istanbul, you are welcomed in a very charmed island where no cars are allowed and the only mean of transportation are horse carriages, bicycles and your feet. The beautiful villas were all shutters were closed during my visit in November, but I felt it was more like a summer destination where families come to rest and children play on the street. It isn't a top thing to do though unless you have enough time. The whole experience from reaching the islands, to spending the full day there had been exceptional. One of the places that I look forward to visiting again. If you need an escape from Istanbul, which is one of the most beautiful cities on earth and one I would like to escape back to, then the islands are the way to do it. I went in March, so the weather was slightly chilly but not too bad, and there's nothing more picturesque than attempting to ride a bike around a tiny island and zooming on the quaint roads next to quaint houses and the occasional mule-drawn wagon.